See life (or rather death) through the eyes of a zombie – only in the macabre triptych Totentanz! 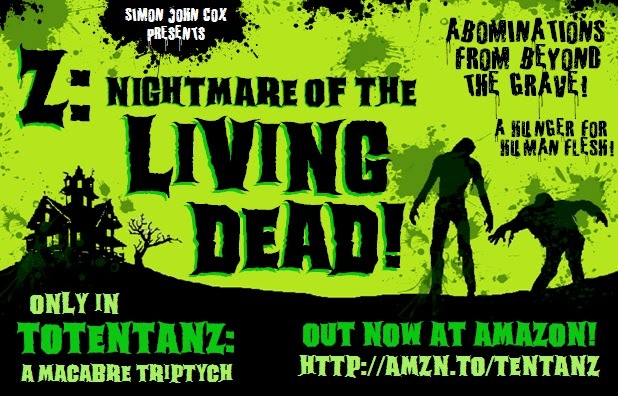 Discover how the shambling hordes of the undead really feel! Experience for yourself their lust for blood! Feel for yourself their vicious hunger for human flesh! All from the safety of your Kindle! These are too fun! Why aren't you posting over in Kindle Boards??? Do you have a third poster planned? I'd love to put these up on my site on Thursday – just a bit before Halloween if that's OK.
And I'd be delighted if you wanted to put them up on your site!